EUCROWD is a project under the Europe for Citizens programme which aims to enhance citizens’ understanding of policy-making processes and encourage democratic engagement by establishing a framework for a crowdsourcing pilot at EU level. 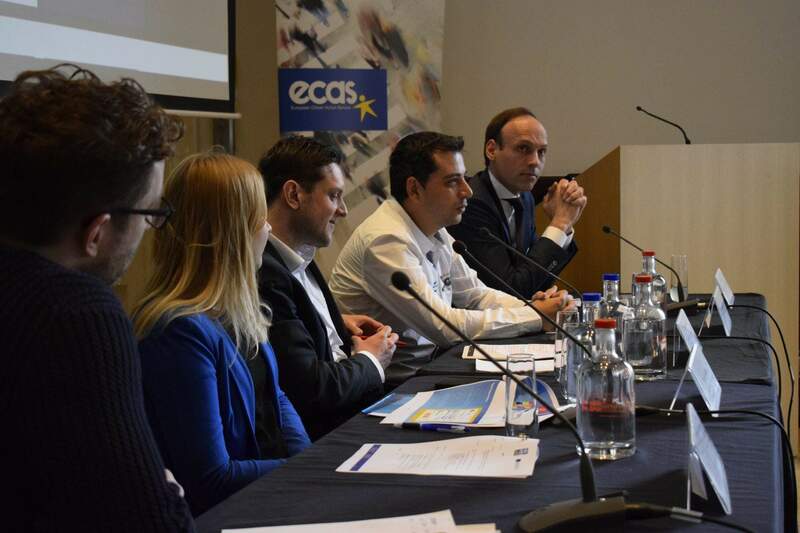 ECAS, in collaboration with 7 partners led by the Institute for Electronic Participation (INePA), is supporting the project by developing a study analysing global examples of crowdsourcing, actively promoting and disseminating the project’s findings among decision-makers and stakeholders, developing a web-based Knowledge Centre for European crowdsourcing, and organising the concluding Digital Democracy Day event. 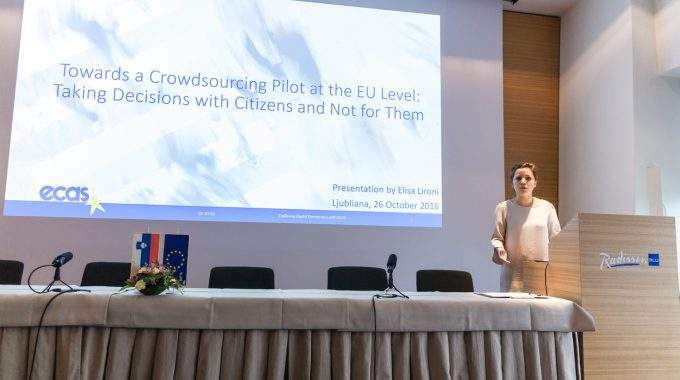 During the launch of EUCROWD in Ljubljana, Digital Democracy Manager, Elisa Lironi, presented the findings of ECAS’ working paper Towards a Crowdsourcing Pilot at the EU level: Taking Decisions with Citizens and Not for Them, and elaborated on what digital democracy is and how crowdsourcing can complement representative forms of democracy to reduce the gap between policy-makers and citizens and enhance the legitimacy of existing political structures. This was further developed by ECAS’ Director, Assya Kavrakova, who participated on the panel Will citizen’s crowdsourcing bring back our democracy? She emphasised the opportunity presented by crowdsourcing to bring newcomers into policy debates, but also the necessity of enabling citizens to directly influence policy-making, 40% of whom wish to do so. 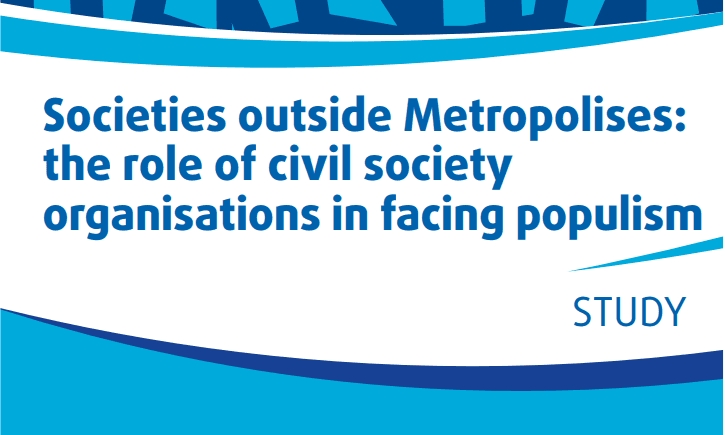 At present, the EU has no tools for real-time engagement with citizens as the only instrument for direct participation, the European Citizens’ Initiative, is not appropriate for everyday interactions with citizens. Crowdsourcing can fill this gap by diversifying the policy-making community and increasing the legitimacy of policy-making processes by both giving people a voice and demonstrating the impact citizens can have on policy-making. Crowdsourcing, which harnesses the ‘wisdom of the crowd’, represents a way for citizens to communicate with policy-makers and can address the problems and risks associated with distrust, low transparency, misinformation and a lack of information. Ziga Turk of the University of Ljubljana, outlined the potential of crowdsourcing as a trust-building tool, whilst Millicent Scott of the Democratic Society and Yvette Jeuken from Netwerk Democratie agreed that misinformation and a lack of good information diminishes public understanding and participation. Other contributors to the conference were Alexandros Tzoumas of Science for You (SciFY), who delivered a workshop on e-platforms and presented their public consultation tool ‘DemocracIT’, Annija Emersone, of Manabalss.lv presented their crowdsourcing platform bringing citizens’ ideas to parliament, and Nicholas Patte of Démocratie Ouverte, who presented the public consultation tool ‘Parlement et Citoyens’. What is certain is that the EU faces an “existential crisis” in the form of populism and fragmentation. EUCROWD seeks to harness crowdsourcing to reinvigorate the democratic legitimacy of the EU by trusting in the wisdom of European citizens and making them partners in the policy-making process.